The other night, the NBA had its annual draft of amateur players and the second pick belonged to the Orlando Magic. Orlando selected Indiana's Victor Oladipo, who showed up in the Green Room at Draft Central wearing a pair of Google Glass. The guard was trying to record everything that was going on around him to keep as a personal reminder of the day that he became a multi-millionaire. 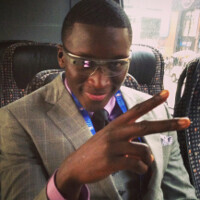 But the NBA asked Oladipo to take off Google Glass. While NBA players might seem to be more in tune with technology than the players of other team sports, the league itself trails MLB which has the best mobile presence of any other U.S. professional sports league. Oladipo wore the device for three days and needed just 5 minutes of instructions to learn how to use them. And now that he is an NBA millionaire, the 21 year old says that he would love to buy his own pair. Of course, he wants them to come in Orlando Magic colors. "Oh, I need five pairs. I want like, black, blue — you know, Orlando black and blue. Or white and silver." We can easily imagine Google Glass becoming a must-have for those used to sitting on the bench. After all, it wouldn't look good if your third-string point guard was staring at his smartphone while sitting on the bench. But instead, put a pair of Google Glass on him and it will look like he's watching the action in front of him intently instead of viewing our latest phone review on YouTube. Great player, and he has the cash for those 5 pairs...congrats bro. Clearly he's a geek who lives in his mother's basement playing D&D and flashing custom ROMs. Now, who was the tard here who swore he'd throw a rock at the first person he saw wearing these in public? Just because a successful NBA player who has been SPONSORED and PAID to wear these doesn't mean they wont look slightly douchey in public. That is so cool that he'll always be able to go back and almost completely relive what will probably be the best day of his life. Google Glass scores a major point here! He was "ASKED" to take them "OFF". Yeah, Google scored a major point indeed. 3:14 There's no escaping Tim Crook's lawyers.